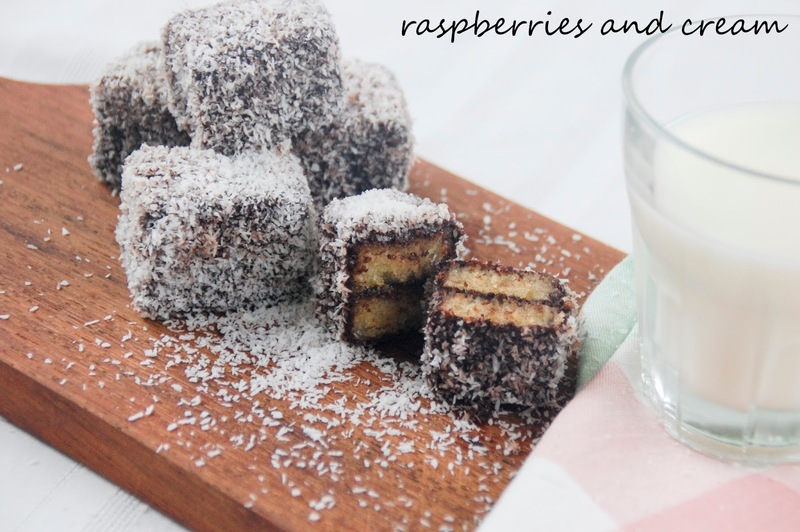 Raspberries and Cream: *PALEO* Lamingtons! 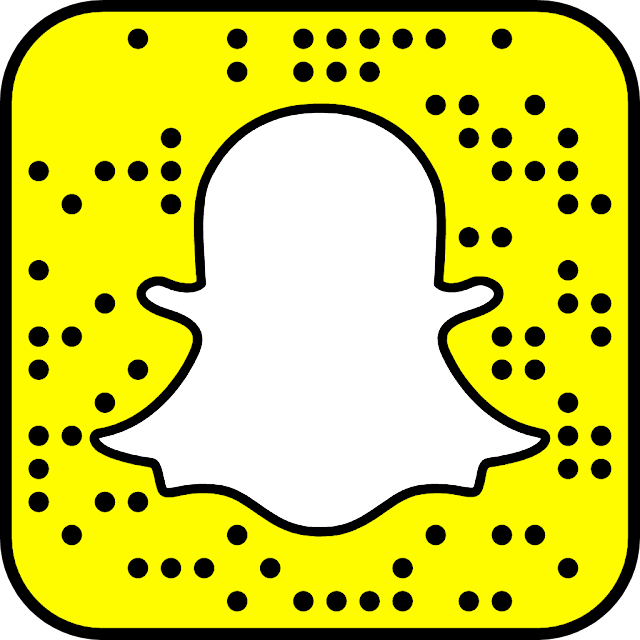 So you know that craze that's going around? The "Paleo" craze? No? Basically it's a new-fangled diet (or rather...an old diet), which is based upon the supposed foods which palaeolithic humans ate thousands of years ago. It's a diet free of grains (i.e. wheat, rice, oats...etc. ), sugar, foods high in starches (like potatoes or corn), dairy products, and other processed foods. The concept is to eat a diet which is high in protein and healthy fats, and low in sugars and carbohydrates. 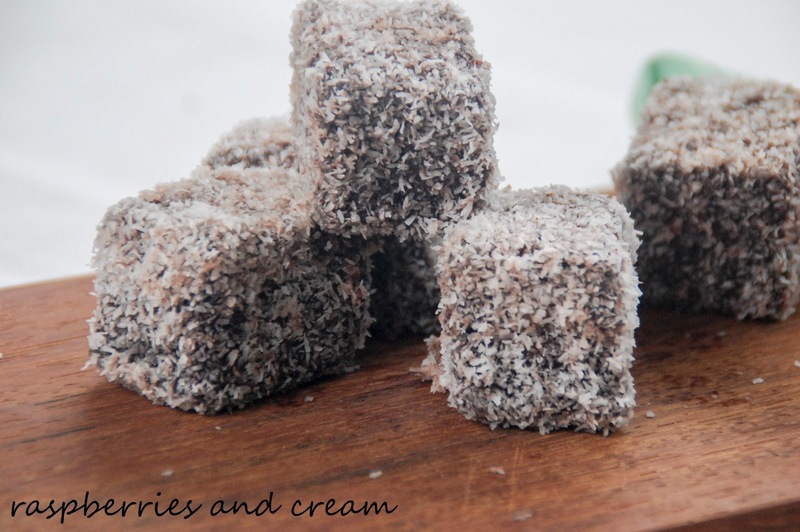 Take, for instance, these lamingtons I made for Australia Day. I will admit, they're not at all like the fluffy, sweet, chocolatey creations you can buy for a few dollars at Coles; but they come pretty damn close, especially if you're not used to eating a lot of sugar. 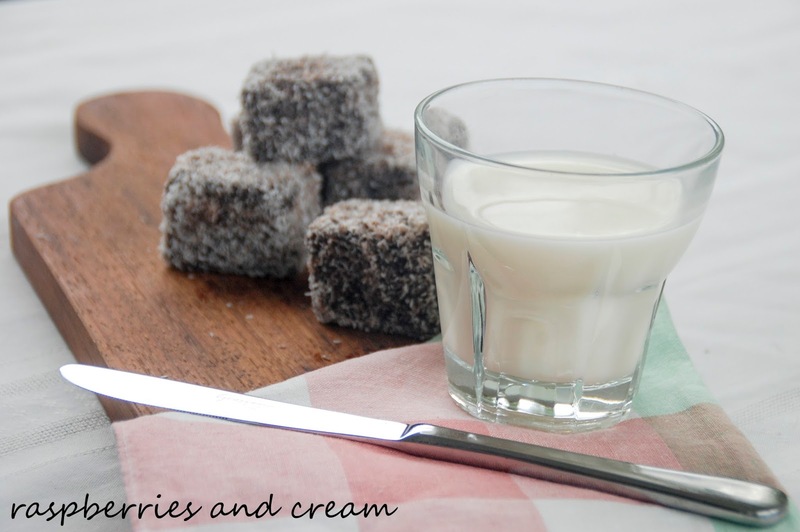 And, if you feel slightly alarmed by the whole "paleo" idea, just think of these as being grain free, gluten free, sugar free and dairy free lamingtons. Actually, on second thoughts, that doesn't really sound too appetising. 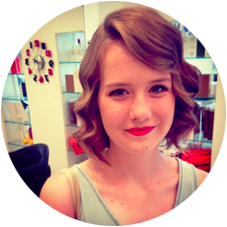 You get my gist, though...? For the sponge: Beat together the coconut oil, honey and vanilla extract. In a separate bowl, beat the eggs for a good five minutes until thick and foamy, then add the coconut oil/honey/vanilla in a thin stream. Using a whisk, fold in the baking powder, tapioca and almond meal until just combined. 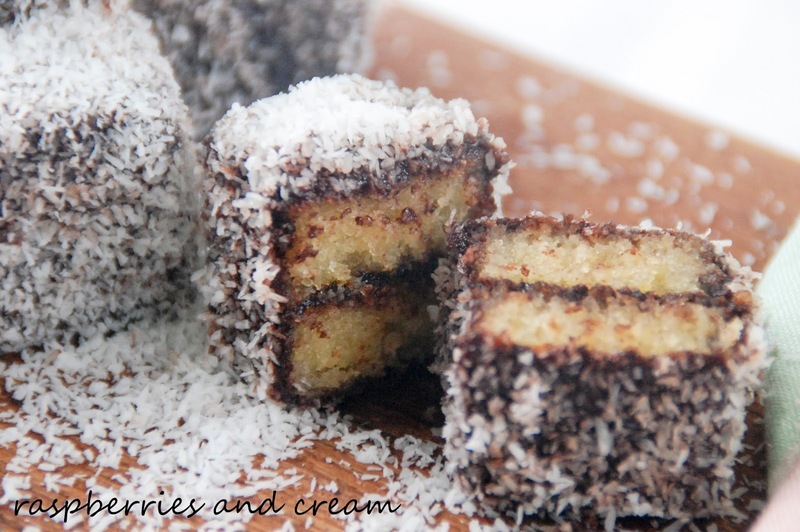 Pour the mixture into a lined lamington tin (approximately 20cm by 30cm) at 165C for 20 minutes. For the icing: Combine the cocoa, coconut oil, honey, vanilla and milk and whisk until smooth. It is quite a runny mixture. To assemble: Cut the sponge in half lengthways. 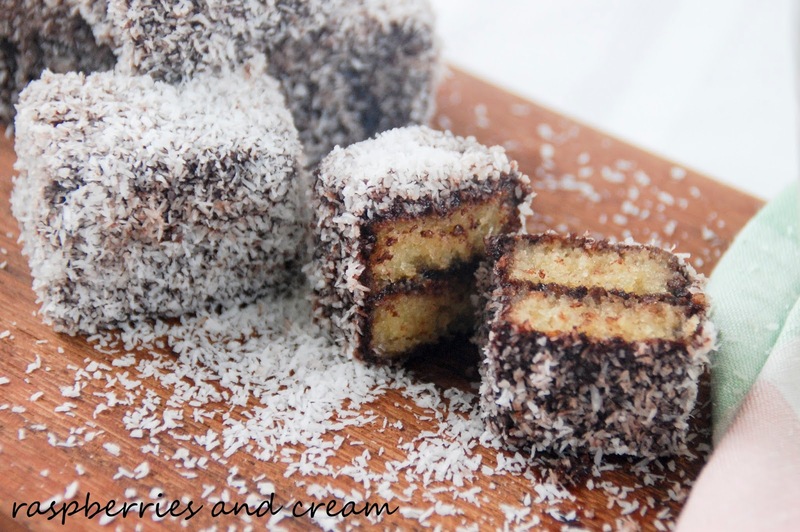 Spread chocolate icing on one half and top with the other half of the sponge, so you have one giant lamington-sandwich sort of thing going on. Cut your giant sandwich into whatever size lamingtons you like. I cut it into 2cm-wide fingers, then cut each of those fingers in half again. Set up the icing in a bowl, and the dessicated coconut in another bowl or spread on a plate. 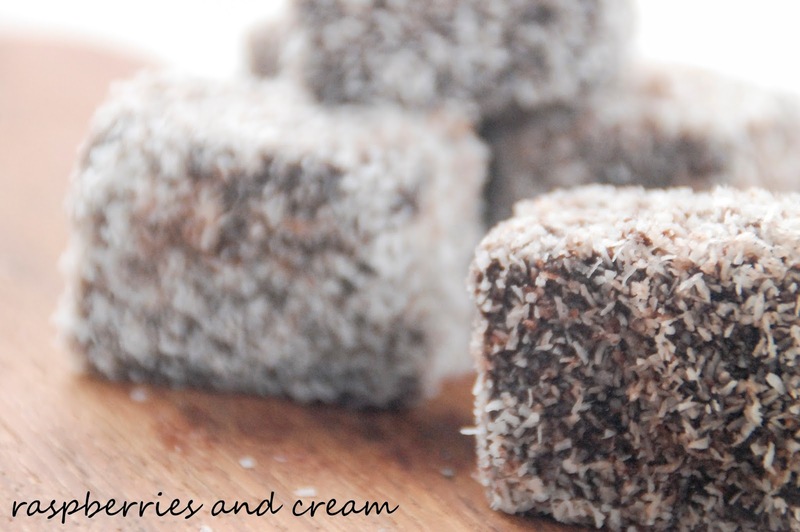 Dip each lamington first into the chocolate, then cover it completely with coconut. They taste best if they've been left for a couple of hours for the chocolate to soak in a little, and will become quite firm if they're stored in the fridge. So there you go. 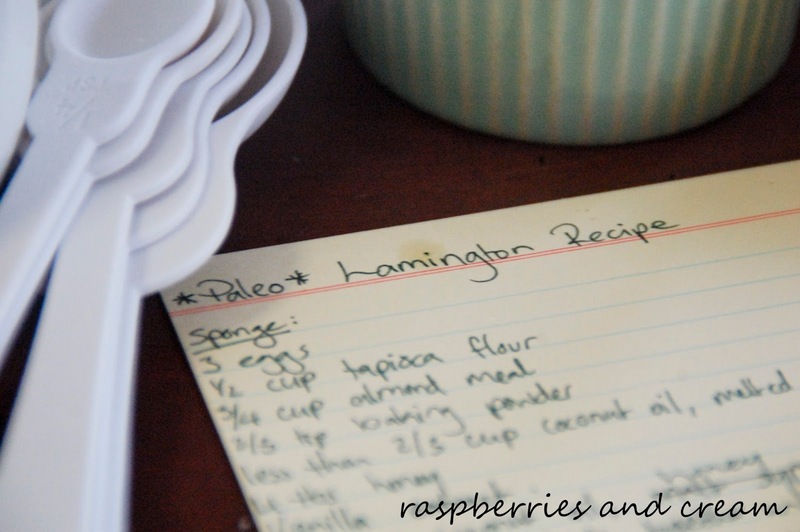 Lamingtons probably aren't the best introductory recipe to paleo-ism, but that's what I felt like and this is my blog. Deal with it! Hahaha, I kid :) Thanks for reading, and make sure you tell me what you think if you get a chance to make these beauties!